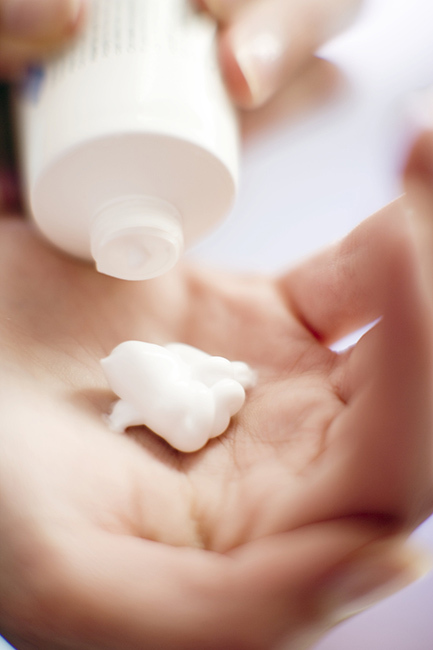 If there’s one product you should always keep within reach during the winter months, let it be hand cream. Regardless of how often you moisturize, it always seems like the thin, delicate skin reverts instantly back to its scaly texture after just one wash … and if you’re a frequent applier, you’ve probably found that most formulas leave your hands greasy, too. If you work at a computer or, really, do just about anything with your hands as part of your work, dryness may seem like the lesser of two evils when compared to slippery fingers. We maintain that, because dry, flaky skin causes premature aging (and you can really tell a woman’s age by her hands), hand cream is an absolute must—but that doesn’t necessarily mean you have to settle for that unappealing slick feel. If you’re having a hard time choosing, or don’t even know where to begin, let our favorites—and Dr. Dele-Michael’s, too—guide the way. “This non-greasy cream is formulated with essential ceramides, niacinamide and hyaluronic acid. [The formula] helps repair your skin’s natural barrier while protecting from the harmful irritants and allergens that your hands encounter every day,” says Dr. Dele-Michael. “This formula intensively moisturizes and is enriched with buffered alpha hydroxy to gently exfoliate,” Dr. Dele-Michael advises. Known for their use of powerful anti-aging grape antioxidants, Caudalie’s hand cream is a must-have. Its organic shea butter-rich formula instantly absorbs into skin, leaving a soft, silky texture behind. Bonus: It hydrates nails, too. Don’t let the oil in the name fool you—the rich, thick shea butter and dose of water keep the lotion from getting greasy. This oatmeal-based lotion not only moisturizes without getting slick, but it relieves common itchiness from the cold.